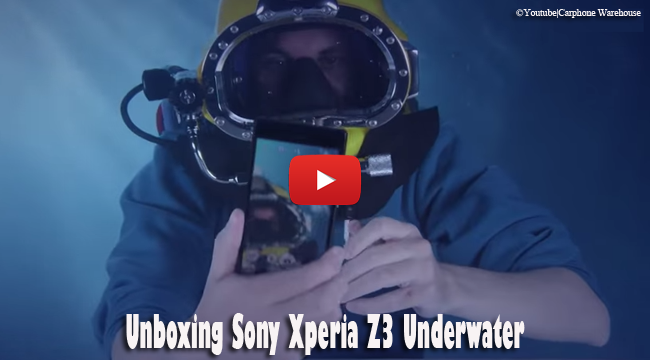 Sony had introduced Sony Xperia Z3 as waterproof, so Carphone Warehouse made a video of unboxing Sony Xperia Z3 underwater. Posted on September 25, the video now has almost 500 thousand views as they caught people’s attention with their unique way of unboxing. As written in the video description, the team thought no better way to to take it out of its box, so they dove into the pool to prove that it s indeed built to last underwater. After opening the then seemed soggy box, they had show the sleek Xperia Z3, brand new and still with the protective transparent film. Sony Xperia Z3 is 146mm by 72mm while it is 7.3 mm thick. Powered by Android 4.4 known as KitKat, inside the sleek phone is a Snapdragon 2.5 GHz Qualcomm Quadcore and 3G RAM. While it is undeniably durable underwater, it is also dust tight. Take it underwater and you can capture creative photos with its 20.7 MP auto focus camera. Enjoy watching videos with the 5,2” Full HD screen for 10 hours without worrying with its battery life. With the 3100 mAh battery, you can talk on phone f0r 16 hours or delve into music for 130 hours. Complete with diving gears, team had shown that the phone had well rounded edges while the charging, USB port, SIM and SD card slots are on the side. The earphone port is at the top. As much as the vid had been informative, the team had made it quite entertaining with a toy gold fish and sarcastic statements.